The tiger vs dragon energies are a symbol of the struggle between positive and negative chi energies. In feng shui, the dragon vs tiger power struggle has one ultimate goal, the balancing of these two opposing powers. The dragon and tiger meanings of yin (female) and yang (male) demonstrate the need for balance. When these energies are balanced, harmony can be created within your home environment and your life. China's various martial arts disciplines have symbolized the long-standing rivalry and conflict between the dragon and the tiger. They are very powerful creatures, and both are needed to achieve the delicate balance of male and female or yin and yang energies. The symbolism of the dragon, the celestial guardian of the east as an opponent of the tiger, has a long history in the Chinese culture. The opposition by the tiger sends a powerful message because the dragon has long represented the Chinese emperor and those of royal blood who claimed to be descendants of the god dragons. The white tiger is the celestial guardian of the west compass direction. This direction rules the luck and prosperity of your descendants. As the protector, the tiger is an auspicious symbol in feng shui and ensures that the family's wealth, health, and bloodline continues. When the tiger and dragon are at odds, the family bloodline and future is threatened. This is one reason the two energies should be in balance to work as a whole and not divided, which is self-destructive. In the metaphor of dragon energy belonging to the emperors, the tiger challenges what it perceives to be a long-held power. With this adversity, the emperors' hold on the world loosens, and the tiger helps to level the playing ground and restore a balance to a world held hostage by one group - the emperors. The tiger's goal is to take away part of the dragon's power and force the order of the world back into a perfect balance of yin and yang energies. The goal of feng shui is the same. The idea is to restore and maintain the balance of power between yin and yang energies in and around your home. Any student of feng shui will immediately see the irony of the Chinese emperor holding such an imbalance of power when the doctrines of feng shui teach the necessity of balance in all life. In the face of feng shui applications, it then seems that the thousands of years of dynasties should have been in direct opposition to feng shui principles. If you examine the culture, it's clear to see the dynasties, in fact, did create an imbalance of power and riches. In addition, the emperors were the only people in the country allowed to use feng shui principles. The knowledge was closely guarded because it was deemed powerful and only an emperor should hold such power. The only feng shui masters and practitioners in the country were part of the emperor's court. The dragon truly remained all powerful. The martial arts were a way to challenge this ideology in a symbolic way that was non-threatening to the emperor. Martial arts masters created this role-playing by depicting the tiger and dragon in combat using opposite techniques. The opposing techniques were also symbolic of the opposite energies of chi energy and yin and yang. The dragon and tiger represent yin (female) and yang (male) energies. The dragon represents yang and the tiger symbolizes yin. This can be a significant feng shui tool you can use when trying to balance the energies of your home. How would you tame a tiger? What elements can you add to your home to create more yang (tiger) energy? How would you put out the dragon's fire? What elements can you use to add more yin energy? This approach to feng shui gives it a new creative point of view. It inspires to reach beyond the typical feng shui remedies and tools. When applying animal energy to your feng shui design, start by examining the qualities of each animal and how they move through the world. The attack strategy of the tiger is unrelenting and powerful. The tiger is fiercely loyal and will protect himself and his family. This motivation makes him a fierce opponent. Many consider the tiger style of fighting to be a "hard" style. Apply tiger energy to your home to boost the lives of your children and their heritage. Add photos of your children in the west sector of your home in a grouping for a powerful energizing of tiger power. Be sure to use metal frames to further activate the metal element of this compass direction. Include the tiger's eye stone in either a small piece or in an expensive carving of a tiger from the stone to the home. Use metal in the west to activate the tiger energy with such things as metal trays, bowls, or pairs of metal lamps. Add tiger representations to your home, especially those of a mother tiger and her cubs; otherwise, use a pair of animals. If using a painting of one tiger, then add another painting of a single tiger. Repeat tiger stripes in fabrics for a pair of pillows in your home. A cat is the living embodiment of tiger energy. If you have a pair of cats as pets in your home, then you have feng shui tiger energy. Use items that are round or have a fluid movement, in sculpture form or as water movement throughout the home. Place a dragon inside your front door area, facing the door, to protect your home and family. Alternatively, place a dragon in the east corner of your office facing the door. Use a pair for greater success and protection. A wood dragon would be the ideal choice for placement in the east sector of your home. Place a painting or poster of a Chinese dragon on your east wall in the office for excellent business success or in the home to secure family's wealth. 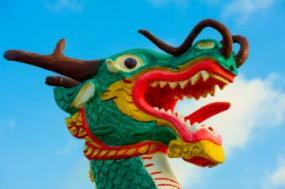 The dragon quickly became the symbol for abundance and wealth because the emperor was wealthy. You can use the dragon symbol for abundance to remind you abundance comes in many forms beyond monetary. The east sector of your home is controlled by the wood element and is your health region. Activate by adding more wood elements to this part of your home, such as wood furniture or wood carvings. 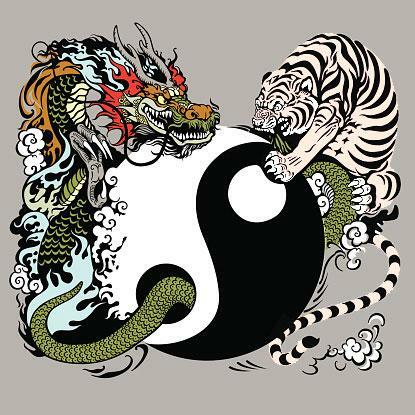 The goal of the dragon versus tiger ideology is to achieve that ultimate balance of yin and yang energy. This philosophy translates throughout feng shui principles and can be used for the goal of restoring a balance to the chi energy in your home.